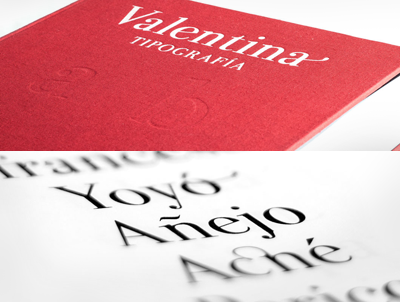 Valentina is a beautiful didone typeface designed by Pedro Arilla and named after his grandmother. It's available for use in personal or commercial work. So lovely! Download it here for free, or make a donation to keep Pedro going. so beautiful. how nice to name the font after is grandmother. gorgeous :) how do you use the alternative characters? i found the ms word setting to turn ligatures on and all of the accented characters under "insert symbol" but couldn't figure out how to get those alternates. Oh, good question Alicyn. I was just coming over to ask how to do the same thing. This is a lovely font - I'd like to be able to use all of it! Yes! I downloaded this beautiful font too but I can't figure out how to use the alternative characters - please tell! There's nothing better and more chic looking than a plain font. Thanks for posting! Thank you! I love new fonts. Alicyn, not sure, since I rarely use Word! I'm an InDesign user. Did you try Googling for tips? Thank you so much for sharing this! Such a pretty font and even nicer that it's named after his grandmother. I contacted Pedro and asked him how to access the alternate fonts - looks like you can only do it if you have Adobe Illustrator and Indesign. It's the same in Illustrator. I hope this mail helps you. Kykeasey, thanks for checking it out. I wondered if that was the case. MSWord just isn't designed for, well, design. But I like that Pedro offered a hug. Glad to see this, as I just wrote to him, asking the same question. Thanks for your great blog--I just finished teaching and have had some time to catch up--always fun to be on these pages!